This is my very first attempt at making any sort of jam. When we visited our daughter in Caloundra on the weekend, they had this very fruitful orange tree at their new rental property. Yes, I thought, I'll take some and make some jam. 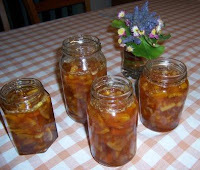 I only used 5 small oranges to make these four jars of very ordinary marmalade. I have learnt a lot though, and may make some more next week when we return from the Gold Coast. What I have discovered is that there is a very fine line between jam and toffee. Also, I was extremely lazy in cutting up the oranges and thought a little bit of pith couldn't hurt. Hmmgh, I definitely should have peeled the rind off, removed the pith and then sliced up the oranges. Instead, I just chopped away and threw it all in the bowl. Well, the upshot is, it actually tastes okay, but I think the big lumps of rind will be a little hard to digest! Oh, about the rain - we did have a little. The weather is still like spring weather though, hope it keeps up for the weekend.